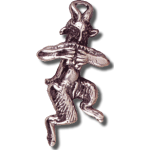 The Greek God Pan is perhaps the most familiar form of the Horned God/Wild Man archetype here in fine bronze as a pendant. Meticulously crafted in bronze, Oberon Zell's modern interpretation of Pan celebrates the primal power of lusty male energy. Measures 1 1/2 inches high. Item Number: MT-PANPIPEBZ | Approximate Size (Inches): 0.25 wide x 0.25 deep x 1.50 high | Approximate Shipping Weight: 0.25 lbs.